A well defined Account Cadence is critical to account management success! The best account managers and sales farmers are proactive with their accounts. They establish a regularly scheduled cadence across all of their customers stakeholder groups. A good account cadence is both vertical AND horizontal, giving the account manager the visibility and engagement required to get the most out of the account and avoid reactive management. 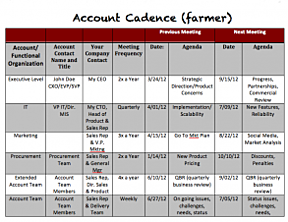 Learn more about getting the most out of your Account Cadence Template HERE.